I have known the Rev Simon Holloway for a number of years. He was the vicar at St Wilfred’s in Horley, Surrey where we keep a UK base. He, & his wife Pauline, came to stay with us for a holiday in Alsancak about three years ago. Much to our surprise he returned to Cyprus a few months later to become the Chaplain for Ayia Napa! Simon & Pauline have stayed with us this week during the set up and production of this musical. been brought to Cyprus by Roger with professional musicians and singers from the UK taking part along with Devon Brown, part of the Cyprus team, who plays a leading role. The show has been presented in Larnaca and Famagusta at the Raif Rauf Denktaş Centre where there were over 100 people present and tonight, the 19th November I went along to St Andrews Church Kyrenia where again, around a hundred folk attended. The musical was actually performed within the church, which gave it a very authentic feel with the stone arches & windows. It was a brilliant performance and I very much look forward to Roger & his team returning again to St Andrews’s, Kyrenia. The show will also be shown in Limassol on 22nd November and 24th November in Nicosia. 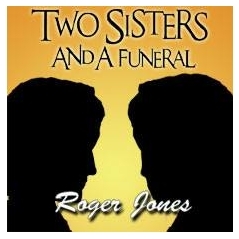 As well as conducting the performances of ‘Two Sisters and a Funeral’, Roger Jones will be leading worship seminars for local churches in Larnaca, Limassol and Paphos, and a member of his team, Devon Brown who plays the part of Lazarus, will be appearing in ‘An Audience with Devon Brown’ in Ayia Napa and Paphos. For more information about this and future events please view the website www.cmm.org.uk/cyprus13 or email: simonholloway55@yahoo.co.uk or ring 97839349 (Cyprus). We would like to thank the Rev Simon Holloway and ” Two Sisters and a Funeral in Cyprus” on Facebook for sharing pictures which have helped create this article.